Croton texensis (J. F. Klotzsch ) Muell. Arg. Stems: Erect, often with whorl of branches above mid-point, densely woolly with star-shaped hairs. Leaves: Alternate, simple, variable, oblong-linear to narrowly ovate-oblong, .4 to 3.2 inches long, .2 to .6 inch wide, green to yellowish-green, densely hairy with star-shaped hairs, undersurface more so, usually paler than upper surface; margins entire; base rounded to blunt; tip rounded or pointed; stalks .2 to 1 inch long. 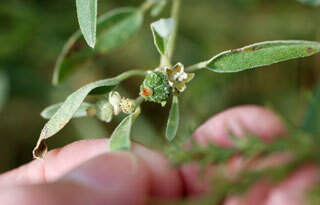 Inflorescences: Raceme, short, dense, 2/5 to 4/5 inch long, terminal on branches, appearing as dense clusters. Flowers: Dioecious (staminate and pistillate flowers on separate plants); staminate plants with numerous flowers; calyx 5-lobed, 1/12 to 1/6 inch across; lobes triangular pointed, united at base; stamens 5-20; petals absent; pistillate plants fewer-flowered, more stout; calyx 1/10 to 1/6 inch across, 5-lobed; lobes triangular, united at base, woolly pubescent, tips pointed; petals absent; styles 3, each divided nearly to base into 4 or more branches. Fruits: Capsule, nearly spherical, 1/6 to 1/4 inch long and wide, densely covered with woolly star-shaped hairs, often warty, 3-seeded; seeds oblong-ovate, 1/8 to 1/6 inch long, smooth, brown. Habitat: Sand hills and prairies; sandy soils. Toxicity: Toxic to cattle, but generally not consumed. Occasionally consumed in contaminated hay. Symptoms include digestive tract irritation and diarrhea. Forage Value: Seeds consumed by wild doves and other birds. Thus, the common name "doveweed". Uses: Native Americans applied crushed seed powder to sores, steeped the leaves and took the liquid to treat venereal disease, stomach pain, and as a laxative. A liquid made by boiling the plant was used to bath sick infants and as an eyewash. Seeds were placed in the ears in the belief that they would help the partially deaf hear better.